Career Development Plan - Can I be a professional dancer? I recently started Pointe and instantly fell in love with it. Now I am seriously thinking on pursuing a dancing career, the problem is, when i was younger I didn't receive the appropriate ballet skills, my teacher never taught us the basics seriously. So now I am trying to get better at Pointe by practicing more often, stretching almost everyday and looking up things that may help me. I just need to know, do i have a chance at becoming a professional? To:- Career Development Plan - Can I be a professional dancer? Thank you for contacting me, it is lovely to hear from you. I believe anything is possible if you put your mind to it. Along with the physical ability, it's absolutely crucial to be mentally prepared for a professional ballet career. It highly depends on your self-motivation to how you succeed in becoming a professional ballet dancer. 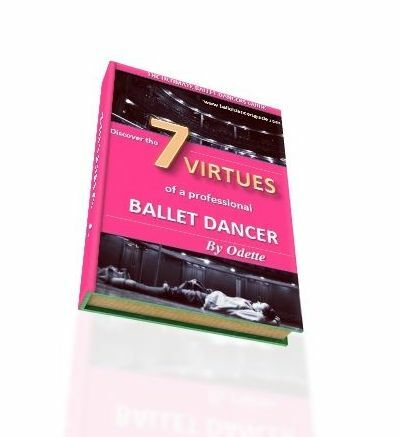 The Seven Secrets, on the 'Seven Secrets of Ballet' page, will give you the key answers of how to thrive in the ballet world. The chances of becoming a professional depend on many factors such as your age, your ability and even your work ethic. It partly depends on how old you are to whether you still have time to secure your dance technique and gather the strength of a professional. I assume you are of a younger age, so there could still be time to secure those basic ballet skills. If you are contemplating on taking up dancing as your profession, then take a look at the Personal Development Plan. This page will explain the gradual stages to becoming a professional dancer. It is the intense, regular training that is most crucial for aspiring professional dancers. If you are serious about becoming a professional dancer, a vocational dance school will provide you with the most advantageous opportunities for you to become a professional. These schools are located around the world and offer training for young aspiring dancers from the early age of 11 right up until they are 18. Follow the advice of your teacher too as she may be able to give you further guidance to the chances of you becoming a professional. Keep working your hardest and do not ever limit yourself. I am so happy to hear your passion for ballet and you are clearly very dedicated, so keep up this great work ethic up. Join in and write your own page! It's easy to do. How? Simply click here to return to Career Development Plan.